Uncategorized – Page 2 – Gretchen Kreahling McKay, Ph.D.
Today I’d like to write about a specific activity in hopes that it might encourage other faculty members to think about how to present material to students that get them actively engaged in the topic, rather than passively listening to a lecture. This is not to say that lecturing is bad; only that there are other ways to present material to engage students and keep them at the edge of their seat. In my Roman Art and Architecture class, we must cover the Tetrarchy, which was a “Rule of Four,” instituted by the Emperor Diocletian when the Empire was divided in half and two rulers were chosen to rule both halves. 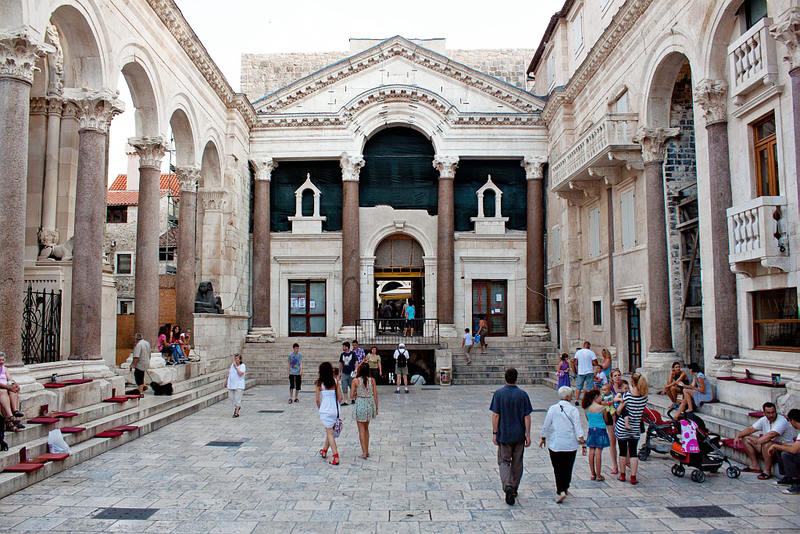 Diocletian built a palace in modern-day Croatia, Split, and it reflected the idea of the Tetrarchy’s rule by four. Instead of showing the palace and telling them about it, I introduce the idea of the Tetrarchy as a political system, and we talk about how equality and similarity were two important concepts that had to be embraced in order for the rule by four to work. This all comes from a wonderful book Art Forms and Civic Life in the Late Roman Empire by L’Orange that I still remember – and use – from my graduate school days. But I have adapted that book and the ideas engendered in it for my current students and active engagement. 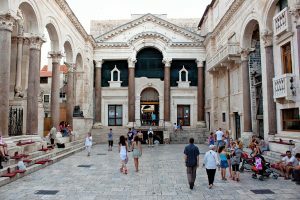 You are architects for the Emperor Diocletian who desires a new palace to be built that will express the ideas of the Tetrarchy. You must design a plan for a palace, sketch it out onto a large piece of paper, and present your plan to the emperor (the class), explaining how your plan represents the ideas of the Tetrarchy. During their final exam period in which the students are asked in part to reflect on their experience and learning in the course, I ask them this question: “I tried to offer you a multitude of learning activities this semester. Which one or ones do you think helped you learn the most? Why? Please explain.” Two students chose this day’s activity as the one that helped them the most after I used it this past spring 2017 semester. My guess is they’ll likely remember it a lot longer, too. What class you could turn over to students to figure out, rather than just telling them the answer? Author Gretchen McKayPublished on July 5, 2017 2 Comments on Mentoring. Advising: The Same? Or Different? Today’s post is about mentorship and advising. And what, if anything, is the difference between them. If you know me well, I don't need to tell you, but for those who do not, I am the academic mentor to the McDaniel College Green Terror Football Team. I love my role with this Division Three team. Beyond attending home games to cheer on the team (and tweeting like a nut during away games that I watch on livestream), my role includes meeting with students for a variety of reasons, all academic in nature. In some cases, I help students who are in academic difficulty. We talk about study skills and what is troubling them in certain classes. I offer them suggestions on how to approach professors for help, which they are often very nervous to do. I have also found that many of them are bewildered by the financial systems and offices at our college, and so I often find myself navigating those offices to find out basic information for them, and find out to whom I should send them for answers if I don’t know them myself. I often advocate for them on issues that seem unfair, as I did when we found out that there was a policy at the college to put a “hold” on making them unable to register for classes because of overdue bills. When I found out the amount of stress and anxiety this was causing students who were already struggling academically, I requested that this be a discussion topic at a faculty meeting and the policy was changed for the next academic semester. I thought today about my role as the mentor to the team and how I advise students. As an academic advisor, I often help students figure out courses of study. We sometimes also talk about career choices, though there is often not a lot of time for that, and students are not often not sure about what they want to do, anyway, and so we end up talking about courses for the future, as well. So, what is the difference between mentoring and advising? (and then there is even "cognitive coaching" see this piece by José Antontio Bowen, but that's for another day). Because I sense that there is a difference. When I think about the students I have advised and mentored, in general I would say that that I know more about those who I am mentoring. I share more about myself, and my own struggles, compared to those who are my academic advisees. That is not to say I do not have strong relationships with my advisees. I do. But the nature of the relationship is different. My football team players confide in me about things that they might not want their academic advisors to know about. They don’t want the professors who are teaching them (who are also often their advisors) to know how they struggle, or why they do. They feel that their difficulties could be perceived by their academic advisors, or professors, as a sign that they do not really belong in college. Thus, they are reluctant to talk to their advisors for fear that their predicament will reinforce the incorrect perceptions that they should not be in college anyway. From my perspective, as a mentor, I am more like a coach who finds ways to support a player to do his or her job better. But my field is academic. But I still feel like what I do as a mentor is different than what I do as an advisor. What do you think? And students I would LOVE to hear from you! What do you think of mentor versus the advisor? Is it the same thing, or are there differences? Does it matter to you what they are called? Published on July 5, 2017 Categories UncategorizedTags advising, highered, mentoring, teaching2 Comments on Mentoring. Advising: The Same? Or Different? I am a crazy person because the summer is in full swing, yesterday was the first full day of summer, and I’m missing my students. I miss the interaction with them. I read something recently about good classes take students on a journey. I hadn’t ever thought of my classes that way, but they are. I try to get them to follow the breadcrumbs that I lay out for them until they see the interpretation I want to them to know. And then we talk about others. But the journey to that idea is really fun. I am already thinking about the first day of class. I get so nervous. I am already nervous (!) thinking about it. I know that many say to not go over the syllabus, to have a quiz on it, but I still feel like it’s a good idea to go over it. Because my syllabi state the goals I have for the students. I want them to know what prioritize in terms of their learning. I got some push-back about that from the tenure/promotion committee that these were not in alignment with assessment protocols of student learning. When I lay out the goals for students, they ARE learning outcomes; they are just not written in the jargon-laced assessment language that as a leader in our reaccreditation work know all too well. But when the students read them like that, they see what I prioritize. Then I ask them to write on a notecard what THEY want to work on. What are their goals for the class? I collect them and (if I remember and have not had the health-plagued semester like I did this past spring) I hand them out at mid-term for a self-assessment of how they are doing. Then I can write how I think they are doing on those goals as well. It gives students a chance to self-reflect, which has been shown to be a very important part of blended and online learning. It helps students identify how they are learning, not just what they are learning. I think we need to do that more in face-to-face classes. Because students learn from their reflections; studies demonstrate this. So, I wait for the first day of class. If after 20 years of teaching I still get nervous, I guess that feeling will never stop. Reacting to the Past hits SXSWedu! Author Gretchen McKayPublished on March 17, 2017 Leave a comment on Reacting to the Past hits SXSWedu! Published on March 17, 2017 Categories UncategorizedLeave a comment on Reacting to the Past hits SXSWedu! I don't quite know how to explain what I am seeing in my classes with male students, particularly football players, when I employ a type of game in a class. I am teaching my introductory art history survey course in a hybrid manner. The students access the content of the course online; they watch videos that are ably created and narrated by two art historians which can be found on smarthistory.org. The students then comment in discussion boards about what they read. The are also required to write papers and carry on reflections on their learning in journals in Blackboard. When we do meet F2F in the classroom, rather than lecturing or quizzing them, I have an active learning scenario planned. We just finished the module on Greek art, and the active learning technique I employed in the F2F portion of our class was a debate/game mechanism on whether or not the Elgin/Parthenon marbles should be returned to Greece. I gave out roles via email. I had one day F2F in class where students mingled in character at a "party" at the Acropolis Museum. Then we had the debate. The students that I expected to do well, did. But six of my male student-athletes in the class, who quite frankly have been fairly lackluster so far this semester, really stood out. Their speeches and their comments and questions hit it out of the park. Five of them happened to be football players. If you have been following my blog, you will know that this is becoming something of a theme. What is it about changing the dynamic of the class that brings about those students who ordinarily fade as much as they can into the background (often, literally, sitting in the back of the room) suddenly rise up and are the stars of the class? I saw it again with this class activity. I also had a colleague of mine run a focus group with the five football players from my fall 2015 semester of Roman art in order to start to gathering some data about what is happening in my classes, not just with Reacting, but with the other forms of active learning that I employ. I hope to post that information sometime soon. But this short game in the introductory class provides another piece of evidence that changing it up, what I call "activizing" the classroom, can bring new students to the fore, and have them actively participate in class. They find their voices and they find their power for learning. If we can find a way to shake it up, I find students, some of whom, I would not expect to do so, will rise to the challenge. Author Gretchen McKayPublished on September 25, 2016 Leave a comment on They Won!!! I posted this to Facebook last night, and I decided to add it here, to my blog. It was inspired by a win by our McDaniel "Green Terror" Football team, after a very long non-winning streak. I believe it is largely my responsibility to engage my students. I believe that students in the middle of the pack often get the shaft. Faculty tend to gravitate to those students "like them" - the high achievers. And I love those students, too. And students with extra needs tend to get a ton of attention. And just ask SASS how often I call them to help a student. I view myself as the Champion of the Middle. Football players tend to be in the middle. They are not the best, nor the worst, students I encounter. I had six of them last fall in Roman Art and decided I was going to make them love the course. By the middle of it, they did (and I have assessments to prove it thanks to Peggy Fosdick). I followed their horrible zero win season last fall, tweeting "My Romans," as I came to call them, before every game to support them. They even inspired me to propose a talk at an international art conference that has been accepted: "A Tale of Six Football Players (and others) and Roman Art." I have six more players this fall and they have lost three games this year. BUT TODAY THEY WON! I simply love them and their dedication and am so happy today I could bust. This is why I teach. The BEST PART OF MY YEAR (and yes I did just go to Greece) was standing at the top of the stairs, waiting for each of them to come up. A few of them started up the stairs, and looked up when they heard me yell their name. In a few cases, their faces lit up when they saw that I was standing there. I hugged every sweaty one of them, still in pads and uniform. My heart swelled and it was The Best. It made me remember why I do what I do and how much I LOVE IT. I can't wait to go to Homecoming and cheer them on again and greet them at the stairs again, too. Can't wait to continue to find ways to engage students in the coming days, months, and years. Published on September 25, 2016 Categories UncategorizedLeave a comment on They Won!! !